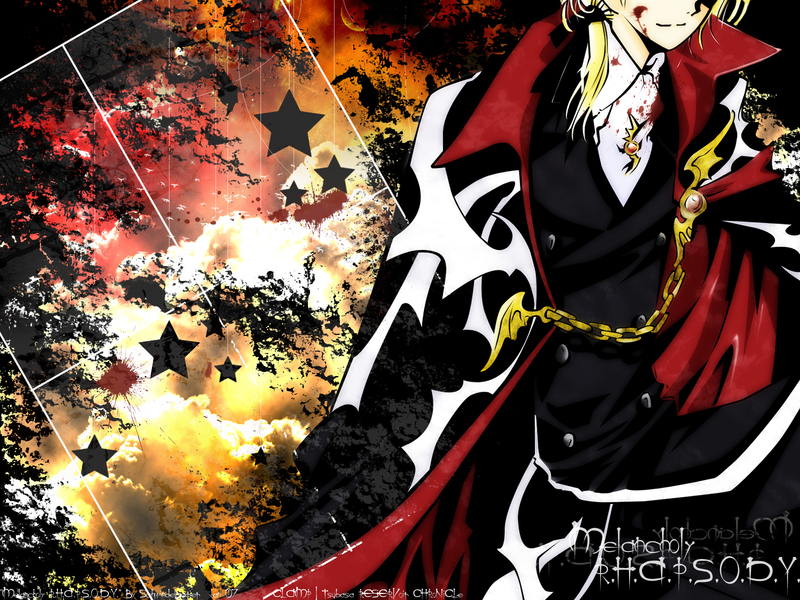 Tsubasa Reservoir Chronicle Wallpaper: melancholy R.H.A.P.S.O.D.Y. Minitokyo »	Tsubasa Reservoir Chronicle Wallpapers » Tsubasa Reservoir Chronicle Wallpaper: melancholy R.H.A.P.S.O.D.Y. My newwest wallie and this time, no D. Gray-man but Tsubasa RESERVoir CHRoNiCLe, my other all-time-favorit XD and it features FAI. I vectored a part of the cover of chapter 141. I immediately fall in love with the scan <3. The blood on his cheek is added, not on the scan actually, but I thought it would be a nice idea to hint at his vampire status. Furthermore it fits to the wallpaper theme but that all is just random. I simply love the use of blood <3. Now, some explanations to the wallie, especially the bg. I love this dim sky and the stars hanging there are for the stress of the melancholy...kinda, dunno why...but it looks nice, doesn't it? Wallie dedicated to Aqi and Jov, my two Fai-Fanatic-friends. that is wicked cool! love it. Wild! XD I know you mention that the background is a little random, but if you look that the three stars near Fai's shoulder and pretend that the biggest star isn't there then you can see a monster. XD The two stars are eyes and the blood is it's smile (there must be something wrong with me XD ). Your wall is made of awesomeness! I think the background matches the foreground very well. Do you have any background anime tutorial which you can point me to? And it's dedicated to Aqi and me. *hugs* Thank you! oh wow I so love this a lot! The vector is awesome, I just so love the smooth look to it. And the background is wonderful. I love the colors so much. The whole sky is so beautiful! Well great job for sure! I really like the blood part! There a bit of too much blood, but you made an awesome use of the combo red+yellow+black. Ooh, this is very nice! I love the vectored image of Fai and the blood too. XD The background of the sky matches it very nicely with the colors and all. Good job! Yeah, I recognise your unique style~! Really cool, I love the back and the color! wow...you are queen. *worships you* I love the blacks and reds, and the hanging stars. It's kinda sad that you can't see his face but then I understand why you did it. *bows to you as she hits the fave button* Awesome work!